This article will present a rules based forex trading system and a short list of rules for more accurate trade entries, and we will also present some basic rules for money management. By incorporating these rules into your forex trading, trade entry accuracy and pip totals should increase substantially. We will start with some basic rules for a simple but effective forex trading system. Then you can increase the number of forex trading rules rules to limit the number of trades, or to enhance the results and overall pips captured on a trade by trade basis. Why Trade The Forex With Rules? Setting up a rules based forex trading system allows you to formulate a complete trading system based on those rules and to test any trading method. This is much different than random trade entries. Rules must be specific, not general. With rules you know when to buy or sell, this reduces stress and is a great way for beginner forex traders to proceed into demo and/or live trading. A rules based trading system means you do not guess or use discretion from trade to trade. Trade entries are not random. You simply follow the rules. The rules you set up should be simple. All traders should avoid complex rules, systems, and technical indicators that cannot be easily explained. If you set up a rules based forex trading system for entering trades and you rigidly follow these rules, the results should be positive trades, pips, and profits. If the results are consistent losses with few or no winners, then the rules you set up or the trading system you are following is a faulty system. Abandon the system and set up new rules. Fortunately, you can discover a faulty system with demo trading, without any financial risk or actual monetary losses. If you start to enter demo forex trades based on your trading rules and you simply cannot make any profitable trades, your system is likely ineffective. The culprit is more than likely the technical indicators behind the system, because technical indicators proliferate the forex industry and simply do not work. Forex traders that are using rules based forex trading system now are almost always using technical indicators, so their rules are based on the indicators. This results in frustration and no pips. Move on quickly from the useless technical indicators and set up forex trading rules that do not rely on indicators. Any forex system that uses rules with technical indicators at the foundation will always fail. Setting up good quality trading rules includes eliminating rules that are not providing results. Every forex trader knows technical indicators provide thousands of combinations but the pips are simply not there. When you enter a forex trade you should always follow a set of rules, these rules should be simple, not complicated. Anyone should be able to easily explain their rules to another trader. No “gurus” or complicated systems, no black boxes. Here is an example of a basic set of five entry rules for any trade. Rule 1 – Trade in the direction of the primary trend on the higher time frames, H4 and larger. Rule 2 – Only enter trades with no nearby resistance on buys or no nearby support on sells. Rule 3 – Trade only if one currency is strong or the other one weak or both, see an example of consistent EUR currency weakness in the example below using our real time trading tool called The Forex Heatmap®. So if the EUR/CAD or EUR/USD is trending down on at least the H4 time frame, go ahead and sell the pair. Rule 4 – Trade only in the main forex trading session for at least 6 months. Rule 5 – Demo trade first, then move to micro lot trading, then continue to scale up to mini lots over time. Build your experience base. Using these five simple rules we lay out in here should result in significant positive pips for any forex trader, without relying on any technical indicators. This way you can make sure your system is valid before committing any real money and going to live trading. The above five rules are based on the Forexearlywarning system, and can be used to validate the system fairly quickly with demo trading. These are five very simple forex trading rules that any forex trader can implement almost immediately across many pairs, with no reliance on technical indicators or complicated systems. Anyone can understand and use these rules. 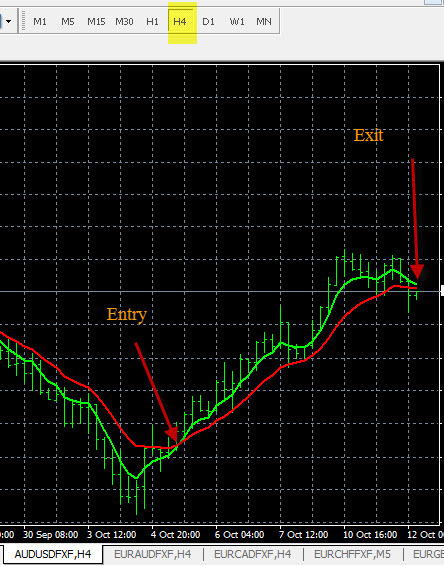 A trader can use some easy to set up, free exponential moving averages to determine the primary trend. Having no nearby support or resistance nearby might be something like 100 pips minimum, more than 100 pips on more volatile pairs, and you can write this into your rules. Currency strength or weakness can be easily measured on entry using live tools like The Forex Heatmap®. Start testing these rules first by demo trading. Trading results should improve immediately for any trader who has been struggling by implementing these five basic rules. These five basic rules can get you started trading with the Forexearlywarning system. Now we can start to investigate some additional rules you can add depending on how strict you want to be. Any good rules based forex trading system will also have rules for money management. Along with the five forex trading rules for trade entries listed above you can also have rules for money management. Let’s start with three basic rules of money management then proceed from there. Money Management Rule 1 – Always trade with a stop order. Money Management Rule 2 – When your trade entry goes into positive pips, like +40-50 pips or more, scale out half of your lots and move the stop to break even. Money Management Rule 3 – Do not enter a trade unless you can possibly get at least 3 pips for each pip you risk. This is a +3 to 1 money management ratio, minimum. For example, if you start your trade with a 30 pip stop you must be trying to get at least 100 pips from that trade potential reward. This is predetermined risk versus reward ratio, in this case +3.3 to 1 which is 100 divided by 30. Keeping the original five forex trading rules in place, and also the original three rules for money management, now a trader can begin to add additional rules or considerations if they wish. Here are some additional rules traders should consider as they gain more experience. The Forex Market is a 24 hour market. This does not mean you need to watch the market for 24 hours because most high quality trade entries occur in a much smaller window of time in the main trading session. If you have a busy schedule then you can set up some rules. Enter trades in the main forex trading session in a 4 to 5 hour window of time, where strong movements can occur daily. When you are monitoring the forex market, if you see a pair that has been moving for several hours, you missed the move. It could continue moving but you want to catch a fresh movement cycle after consolidation or rest periods. So set up another rule for these situations. Additional Forex Trading Rule – Only trade a pair when it is starting a new movement after a consolidation or retracement period, or when a non-trending pair starts a new movement or trend. When you are trading with a trend based system, you would prefer to trade near the beginning of a new trend so you can sit back and ride the trend and let the market do the work. Additional Forex Trading Rule – Trade at the beginning of the trend cycle on the higher time frames, H4 and larger, see an example below. Also, news drivers can move markets and cause stop outs, or additional profits. So you need a set of rules for trading around volatile news drivers. Additional Forex Trading Rule – When entering a trade make sure strong news drivers are at least one hour away to give you time to move your stop to break even on any recently entered trades. Otherwise exit the trade or wait until after the news to consider a new trade entry. Sometimes the entire forex market, or groups of currency pairs are trending and moving with the trends almost every day. Understanding the condition of the market is important to forex traders and can be incorporated into a rules based forex trading system. If many of the pairs and currency groups look choppy on the charts you can set up rules to deal with this problem, like specifying the number of lots traded to be less. Market conditions change from trending to ranging or choppy and if you can identify this, you can account for this with a new rule. In order to be able to know the condition of the forex market you need a technique and set of indicators to analyze. We suggest multiple time frame analysis applied to individual currencies. Using these market analysis techniques will always give you a clear view of the current market conditions, trending, ranging, oscillating, choppy, on any pair or group of pairs with one common currency. One rule might be to evaluate the condition of the market and to know if you have some pairs that are trending up or down. Then you can set up rules based on trending pairs, this is like writing a trading plan. You can use multiple time frames across many pairs to know the condition of the market. Become proficient at multiple time frame analysis so you can identify the condition of the market across many pairs and currency groups. Additional Forex Trading Rule – If you identify a choppy group of pairs or choppy market in general, be prepared to trade less lots on each live trade or not to trade at all until it clears up, which may only take 1 or 2 days. If a forex trader has 6 months to one year of trading experience and is consistently making positive pips, it is possible to “loosen” some of the forex trading rules and look for more trading opportunities. Anyone who has successful traded the forex market this long has earned the right to look for more pips. Experienced traders can look to do short term intra-day trades, trade outside the boundaries of the main trading session, and possibly even trade against the trend. You still need to have a set of forex day trading rules similar to the ones we have discussed so this article. Experienced Traders Rule – If you would like to trade outside of the boundaries of the main session, like in the Asian trading session, it is not a problem as long as you know the limitations and understand how to limit any additional risks. Experienced Traders Rule – If a currency pairs trends in one direction for a week or more, but cycles in the other direction it is okay to do a short term trade against the trend. Experienced Traders Rule – If the entire market is ranging and you would like to do some short term trading trying to make 40-50 pips at a time this is not a problem either, as long as you follow the basic rules we set out in this article. Forex day trading rules are most definitely for experienced traders. Experienced Traders Rule – Reducing the time frame for entry below the H4 threshold, down to the H1 time frame if the other rules are met or there is a fresh movement cycle starting on the H1 time frame. Experienced Traders Money Management Rule – If you identify a choppy market trade less lots or not at all and scale out lots sooner, using strong signals from The Forex Heatmap®. Experienced forex traders can develop more intricate rules for profit taking, setting price targets, and scaling out additional lots. Advanced forex traders should review our resources related to forex profit management then prepare additional rules based on the ideas presented in this great resource. Conclusions About Rules Based Forex Trading – Any forex trader can take this article and use the five basic forex trading rules for trade entries and three basic rules for money management. If you apply the five basic rules your trades will begin to improve, then start experimenting with more rules to incorporate after you become more experienced and successful. Over time you may occasionally loosen the rules depending on what situation the market presents to you.